So the holidays have come and gone this year, and my house almost feels empty without decorations busting from the seams. 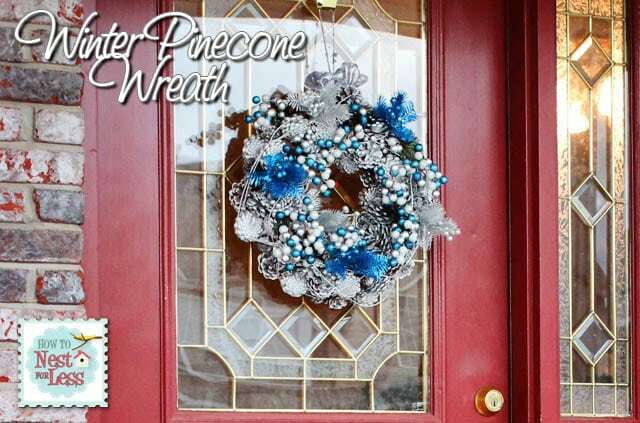 I still wanted a little bit of winter flair so I decided to create a fun and festive Pinecone Winter Wreath using my favorite winter colors, silver & blue. 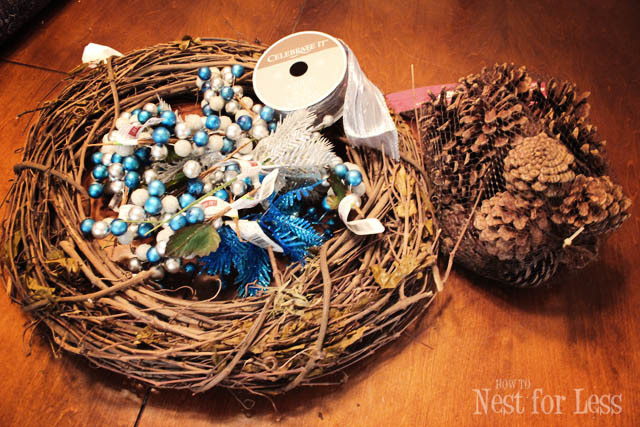 I attached the pinecones that I found on clearance from Michael’s using craft wire and hot glue. I made sure to completely cover the grapevine wreath with as many pinecones that would fit comfortably. 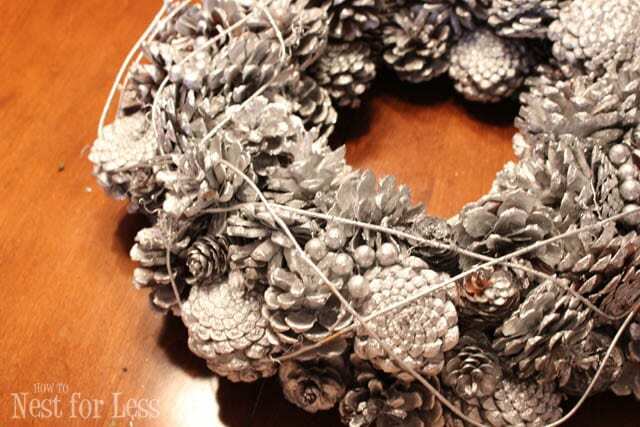 Once all the pinecones were in place, I spray painted the entire wreath in Rustoleum’s metallic silver. Now it’s time to start adding the silver and blue floral picks that I got from Michael’s on holiday clearance. Normally prices at $1.29 each, I got these for 70% off! 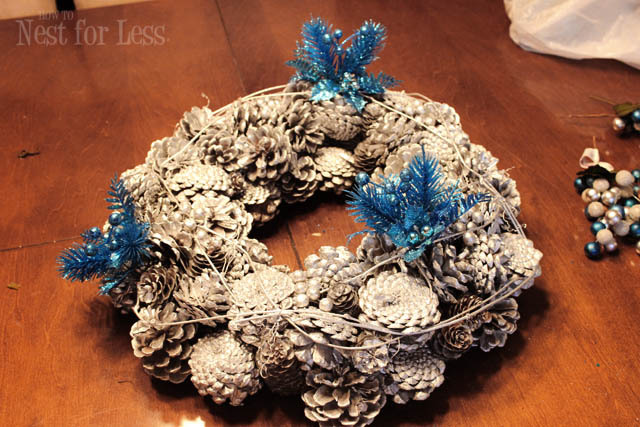 I used my hot glue gun and craft wire again to make sure all of the blue and silver picks were securely attached to the pinecone wreath. I also added some silver ribbon to the top for hanging on my front door. And that’s it! 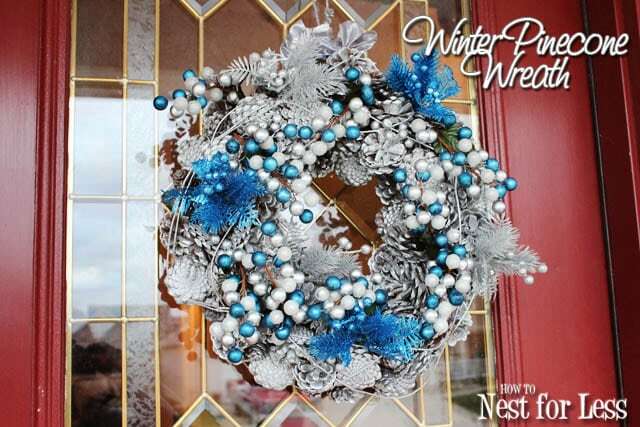 A beautiful silver and blue pinecone wreath to keep your door festive throughout the winter months! Love this! What a beautiful idea! It looks fantastic! 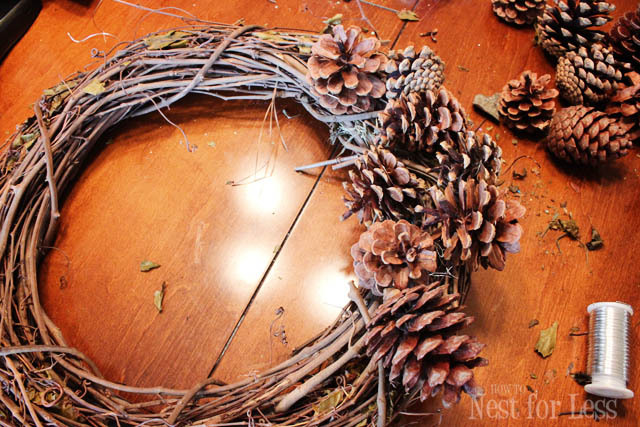 Such a great way to keep decorating after the major holidays are over. 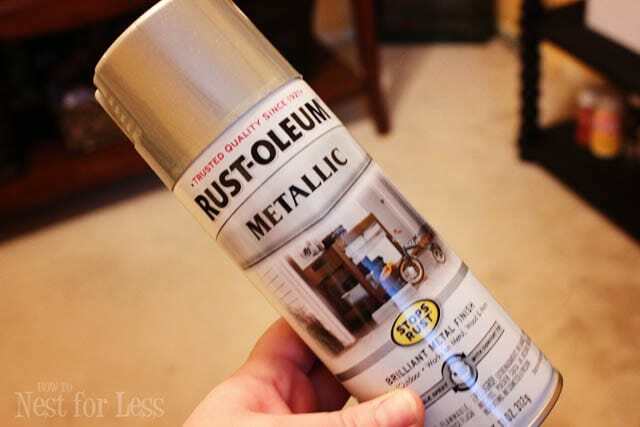 LOVE this idea… will be on the lookout to make one of these myself!!! 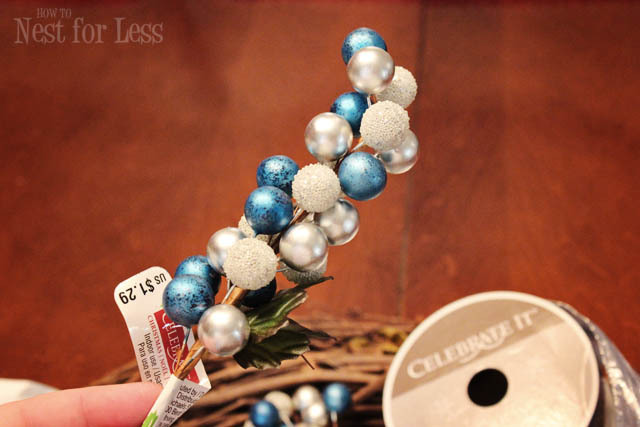 LOVE Michaels and JoAnns too! Scored a fair amount of goodies at JoAnn’s on Monday… haven’t been to Michael’s yet but am planning to… Glad to find a blogger so close to me.. I light in Highland, IL… Love your ideas! Love it! I wish I knew how to do things like that! It looks great! Love it!! So happy to have stumbled upon your blog! Love it! Won’t you consider sharing with my readers at http://sassafrassalvation.blogspot.com/2012/01/sasss-sunday-salvation-show-7.html ? Thanks John! I think the silver & blue makes me think of snowflakes and icicles 🙂 LOVE it. Beautiful wreath! I love the colors! I found you through Lines Across My Face. Thanks for sharing! Thanks so much Ginger! Headed there now to link up some more projects!! 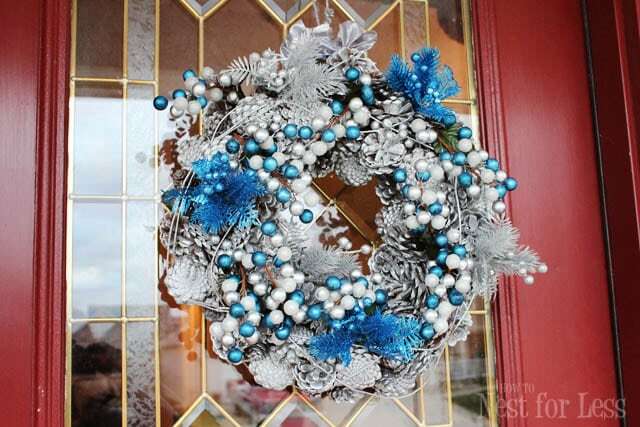 I just used your diy directions and made a gorgeous wreath that looks like it came from Pier1! I am so pleased! It is a gift for my Mother-in-love and now I feel I will have to make one for myself. 🙂 Thanks for the how to directions, I will be visiting your site a lot. Oh, so glad to hear that you love your wreath!! That is awesome, Stephanie!! !